Sometimes I wonder if there is ever much thought put into naming a restaurant. 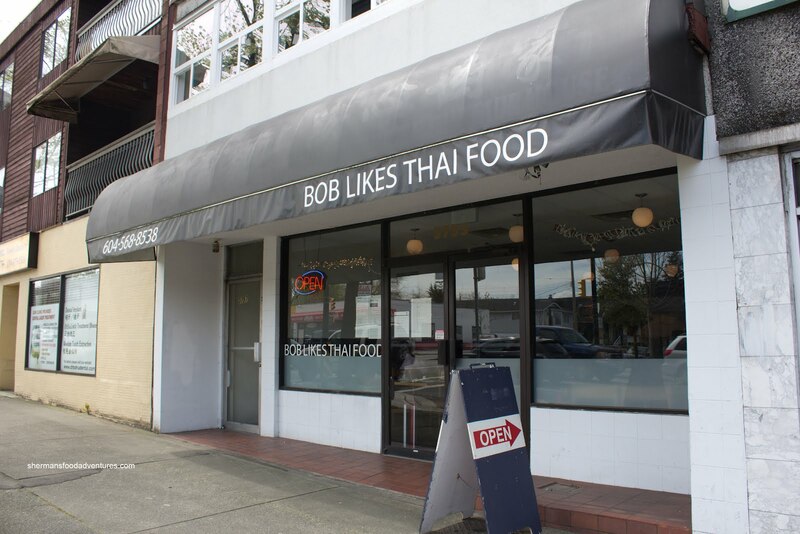 There is the "let's name it after the street" approach such as Kingsway Deli, Slocan Restaurant and The Main. I really love the "it could mean something else" restaurant names as well. Come Along, Pho T&A and the defunct Pho Bich Nga are perfect examples. Oh and I really love the Chinese restaurants that are named "golden". Golden this, golden that, it actually gets a bit confusing. And let's not forget the iconic Fook Yue where Senor Rooster stands now. It was so outrageous, it made it onto Leno. I often wonder how that place did in dail y conversation... "Hey, where did you go for dinner last night?" "Fook Yue"... Anyways, there are too many boring, run-of-the-mill restaurant names out there. However, Bob Likes Thai Food is certainly not one of them. 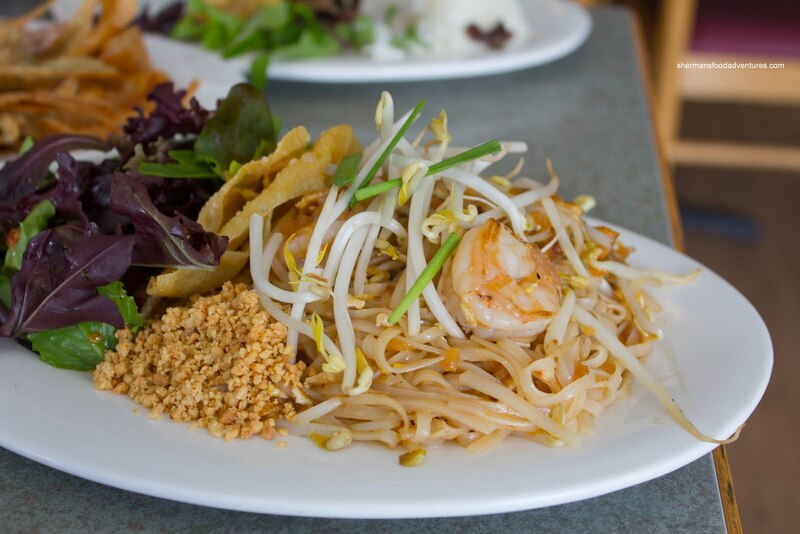 The Thai joint with a funny name caught my attention when it first opened, but due to its relatively early closing time, we could never make it after hockey nor softball. So I had no choice but to visit the place during the day instead. And coming in to rescue me from eating all alone was Rich Guy. Funny how we eat less together since he is back for good... We started with something a bit different in the Miang Kham which literally translates as "eating many things in one bite". 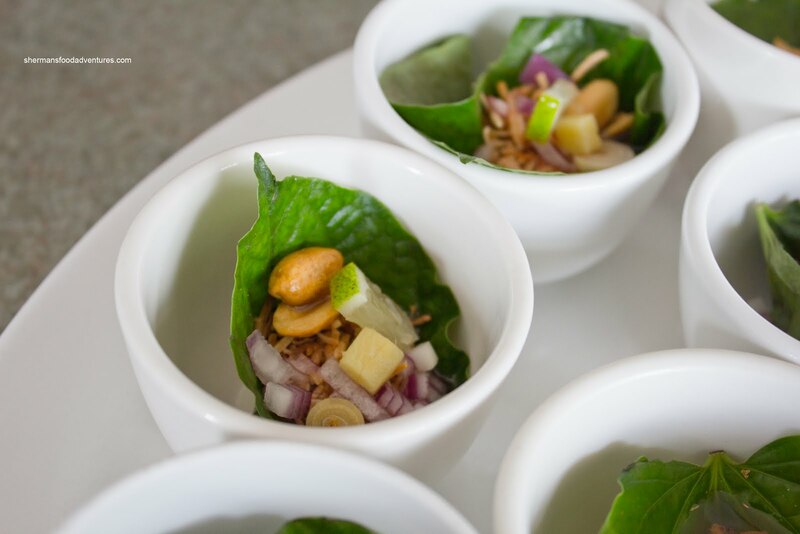 These many things consisted of chaphlu leaves, roasted grated coconut, lime, shallot, peanut, ginger with tamarind palm sugar sauce. For such a simple dish, there was lots of flavour at work. 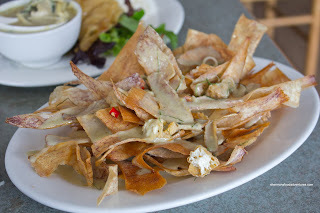 It was aromatic with some spice, a touch of nuttiness, a bit herbal, sweet and crunchy. It practically had all the flavours my tongue could process. We liked it very much. Another interesting item we ordered was the Poutine by Bob. This version saw fried thin-sliced taro root topped by a green curry sauce with lemongrass, lime leaves, deep fried tofu and chilis. Although the flavours were fantastic - with a spicy coconutty curry, the taro chips were a fail. They were far too delicate to stand up to the moisture and ultimately became a soggy mess. Maybe if they used lotus root chips instead? Too bad really since the combination of green curry with the aromatic lemongrass and spicy chilis really did work. They could've added more fried tofu as well. Seeing how their lunch specials (which included rice, salad and wonton crisps) were only $7.50 each, I did my best Mijune and ordered 3 to share. 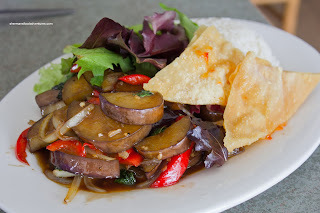 We started with the Eggplant Pad Ka Pow which was quite good. The eggplant was cooked perfectly. It was bathed in a sauce which was spicy, tart and sweet with a hit of basil. We liked how they were not shy about making the flavours bold. 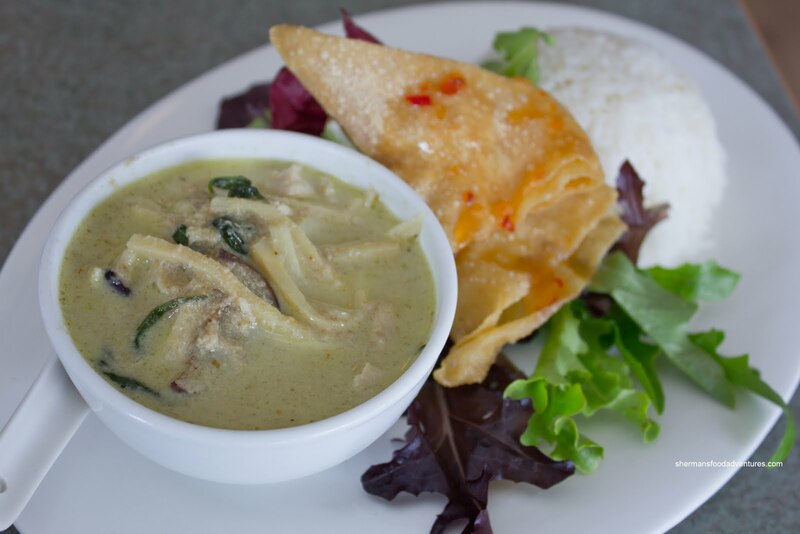 That would the same for the Chicken Green Curry. It was spicier than most other places which made it quite balanced. Rather than being predominantly sweet, it had savoury-spiciness that lingered on my tongue. Furthermore, there was no absence of chicken and bamboo shoots along with the requisite basil. 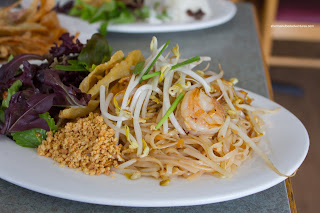 Lastly, the Pad Thai didn't disappoint as well. The dish exhibited good wok heat where the flavours were in sync. By virtue of using tamarind, there was a good tartness that was accented by some sweetness and savouriness. All the usual stuff was present including crunchy shrimp, pickled turnip, pressed tofu, crushed peanuts and bean sprouts. Despite the very non-Thai sounding name of the place, there is no mistaking that the food is legit. The flavours were definitely there, especially the spice level, and the prices were quite reasonable as well.